This is a rare image on this site. Why? Because dawn is not a time I am generally up. The world is divided into owls and larks. A lark I am not. 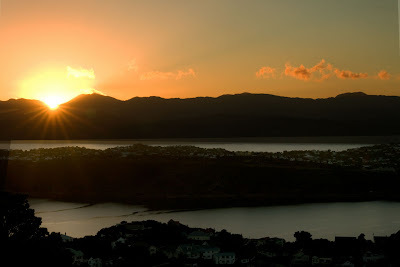 This magical moment is from the hills in Wellington NZ. I am departing now for another part of the world on route back to London. My concession to travelling light this trip was to only take one lens with me. Hmm, bad move. I have been travelling with the lens I dropped a few weeks ago and had repaired. Well guess what- it fell apart where the repair is. Scream. Scream. Shopping is on my agenda at the next destination. I also am not a lark so I very much appreciate the effort, which is extraordinary. So sorry to hear about the lens crisis, that had to be a real bummer. Happy SWF! Getting up early is a drag but to wake up to this? I'd be setting my alarm every morning! I think this would make it worth it to get up early once in a while. It is absolutely breathtaking. Beautiful photo of the dawn's early light. Good luck with the lens shopping. Thanks for the tip on the lone beader. That person has quite a talent. This is a beautiful photo! I love the colour of the sun! Beautiful. Reminds me of Cradle Mountain in Tasmania. wow! !That picture is amazing really,makes you think that we really missing things sometimes,yeah like you I'm not a dawn person too. Sunrise is great all over the world! I like this pic very much. Good color, splendid scene. Wonderful! I will be in Wellington in about 9 days. Uh-oh. Sorry to hear about the lens. Glad you caught this before it happened though — it's wonderful! I'm not a lark either and have yet to be able to take a sunrise photo. Wonderful shot. Sorry about the lens. That is truly incredible. I am palpitaing reading about your lens. It's horrible when that happens. Glad you were up, it's a gorgeous shot! Love it! I think I'll get up earlier! But being a bit of a wine lover - a Wine Noter, in fact, too many late nights makes it tough! I'm an owl too. But we are the best! Love this gorgeous sunrise. Stunning! oh your london snapshots are devine.had a look through them, wonderful images. my 'tuesday world' posts are all of london too.thanks for your visit. As another owl, I appreciate the challenges of dawn photography. You've acquitted yourself well, and give even the larks something to aspire to. Amazing shot! Maybe you'll reconsider being an owl and become a dove! To answer your question, we do have balloons just about every day because this is such a huge tourist area. And most of the tourists are British. Such a great photo; I long to travel but am regrettably stuck in a lab in the US. gorgeous photo of the sun silhouetting the mountains and water. I enjoy following your website. Happy Photo Blogging! I am not a lark either. I prefer to be a night owl. Sorry to hear that you dropped your lens. Wonderful shot! Good pic. At least now I get to see the sun rise. However, if I would chose to emigrate, I can tell you that New Zeland would be one of my top choices, namely for its wonderful landscapes. Your photo is really interesting, especially because of the "little" houses down there.